Your friends are visiting Hyderabad and you’d like them to have the greatest time in their brief stay. Want to ditch the regular tourist spots like Golconda Fort and take them for an even enriching experience? We've got you covered. 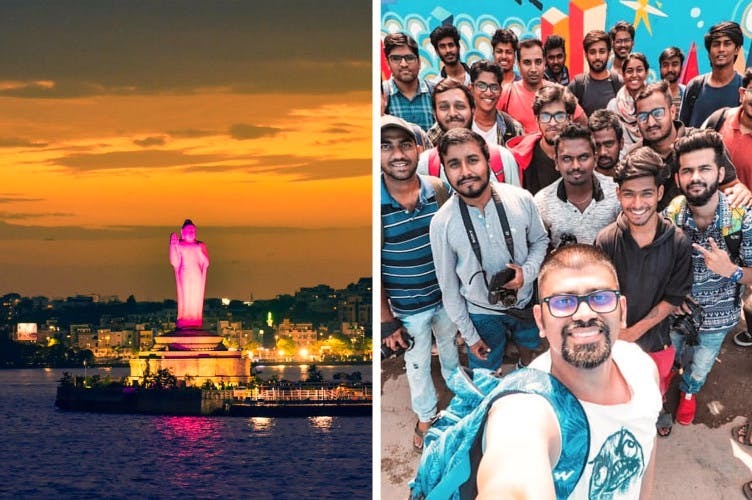 We ask Karthik Abhiram, a Hyderabadi influencer, who explores the city to a full extent, and hosts photo walks regularly. And he tells us where to take your friends. So, follow him on Instagram (And us) and give your friend the best of Hyderabad. Natural rock formations, boulders, and peacocks in the sight are a few things that define Khajaguda Hills. Located just three KM away from Hitech City, these hills have a dargah on top, and watching a sunrise here isn’t something you and your BFF should miss. You can go beyond trekking with activities like rappelling and rock climbing. Several meetup groups conduct these treks or you can be a badass and go all by yourself. The lanes of MS Maqtha district together mark as the hub for street art in Hyderabad. St+art India, a not for profit organisation is responsible for giving a visual identity to what was otherwise an ordinary locality. The NGO, in association with Asian Paints, has made creative comments on topics concerning the environment, education, and some that resonate with the very essence of the chaos and culture of the neighbourhood. There is also a wall painted entirely by the children of Maqtha. As the gleaming smiles of its residents offer a re-exploration of Hyderabad, and welcome travellers — this area is where you need to take your friend to catch some stunning street art. Plus, this space is so Instagrammable that your friend will go back with pictures against the walls. Necklace Road is full of surprises and no matter how cliche it sounds, every evening is different here. Don’t deny your friends the pleasure of strolling in the parks while watching the sunset washing away the sky in orange. Say hello to stray pups or head over to the Dog Park. Also, if you and your friend are the kinds that enjoy making art in public places, this one is the space you can bank on. Needless to mention, our city can do with more art that couples coochie-cooing in the public (Winks). While you are there, be sure to feast on the street food like a roasted corncob, jhaal muri. While watching the Buddha Statue from a distance is charming enough, a boat ride to check it out up close is far more exciting. Telangana Tourism has several boating services including motorboat, parasailing, pontoon boat, jet ski. These are budget rides and cost you anywhere between INR 100-350 per head, depending on your choice. If you and your BFF want to explore this slow, the mechanised boat priced at INR 55 per head is your best bet. And they start at Lumbini Park, so you can cross the park off your list too. While exploring the streets of Charminar is a must-do, it’s the Sunday market that is highly recommended. The bustling market and the hustling crowd will create havoc on all your five senses — the aroma of kebabs and Irani chai, the glitter of lovely glass bangles and all things glimmer will bring out that budget shopaholic in you. Old City, laid-back in its own way, bestirs itself a little late in the noon for the Sunday market that usually runs till the wee hours of the midnight. Pearls, dainty crockery, fresh flowers, and the most unconventional items you’d be surprised to find are sold on Sundays. Don’t believe us? Check out what we found at the market. Located in Lakdikapul, this cafe has gained its name from a popular hospital with the same name in the proximity. Opening its doors at 4.30 am, the show runs till the wee hours of midnight with people rushing in to order the chai which is – kadak – as the Niloufer patriots claim. But what stands out here are the buttery soft Osmania Biscuits that go perfectly well with chai. Be sure to grab a box of them on your way out to savour them at home with your friend. Nehru Zoological Park can be best explored by riding through its attractions. Get here with your mate and rent a bicycle to check out not just the animals that are frolicking in their natural habitats but also the butterfly park and Jurrasic Park. Find yourself gawking at the white tiger and jaguar, and settle down at the Mir Alam Lake, a 200-year-old lake that gushes through the zoo too.